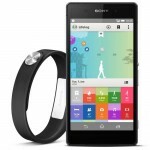 The Sony SmartBand is a fitness tracking device similar to the FitBit or Jawbone UP. 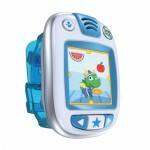 It does not include a display of any kind, only 3 LEDS serve as an indicator. It is compatible with Android devices running version 4.4 or later, including several of Sony's latest Xperia handsets. It can track basic fitness data, but Sony calls it a "lifelogger." It records the wearer's "physical, social, and entertainment activities" for a given day and then allows them to track that data through the companion app.